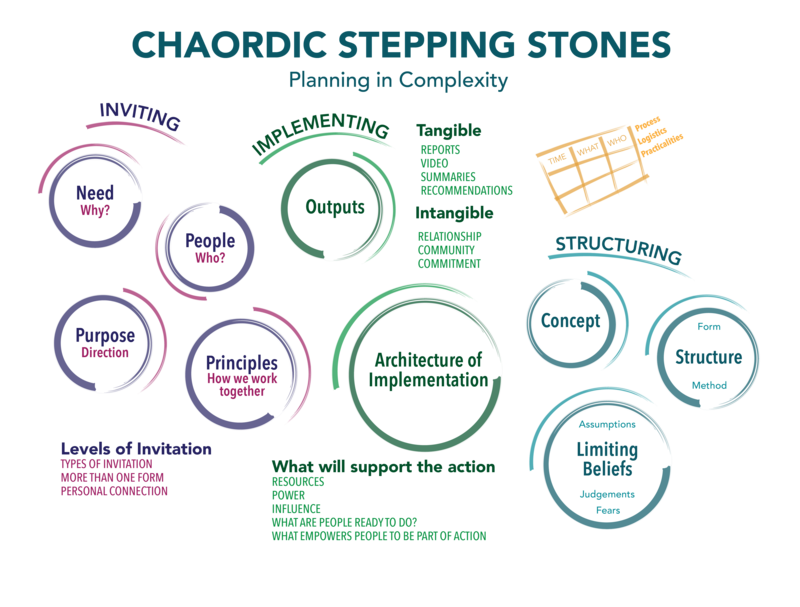 The term “chaordic” comes from combining the words “chaos” and “order.” It is a word coined by Dee Hock to identify organizations that intentionally blend characteristic of chaos and order. I use this term to indicate that we are working in a space of complexity, where there is much that is unpredictable and unknown. With these kids of problems it is crucial that we include people in a highly participatory way to discern, learn, make meaning and act together. Our job as people who are hosting strategic work in this space – whether it is is a conversation, a meeting or a longer term strategic initiative – is to bring some form and order to the unpredictability while letting the emergent properties of complex systems bring us new ideas, insight and innovation. This is difficult to do without a road map, and the chaordic stepping stones provide both a guide path and a set of lenses to plan and reflect on this work. This tool is the basis of all the work I do whether it is a single meeting or a longer term strategic initiative. When working with a client we spend time discerning the need and purpose first. This helps us to find the people who should be involved in a process and determine principles of engagement. Once we have done this work we have the starting material to begin inviting people into the initiative. Once those guideposts are in place we can make choices about structuring the work. We begin by designing high level concepts in order to test ideas and surface limiting beliefs and ways of thinking before they can stop us from doing our best work. After strengthening our ideas and the will to commit, we can make choices about the structure and the logistics for undertaking the project. Planning for complexity requires callers and core teams to be agile and adaptable while also holding good structured form and a strong container for the work. This tool places a substantial focus on the architecture of strategic processes, and encourages leaders to take a flexible and participatory perspective on complex challenges. Done well, it can result in outcomes that are co-created, co-owned and sustainable over time. It builds capacity in organizations and communities and it supports all kinds of leadership and diversity.